Carol Witherington was born and raised in the sunshine of South Africa in the days before apartheid tensions led to 20 years of terrorist insurgency and guerrilla warfare. When those ‘happy, carefree days’ ended forever in the 1960s, white families had to protect themselves with guns and barbed wire. Carol and her family eventually moved to Spain and then settled in the UK, but they had not been there long before they were struck by tragedy; Renaldo, her beloved ‘gentle giant’ of a husband, was diagnosed with cancer. After his death in the spring of 2011 she made her boldest move yet – to a new life in New York State, USA. 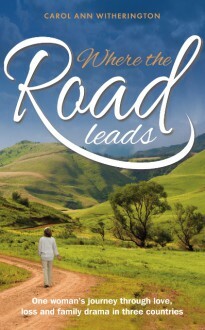 Where the road leads is her story.